That autumn I was traveling in northern Evia and I spent one night in Rovies village , admiring the beautiful olive groves flowing greenish and tufted on the fields up to the northern shore of Evoikos Gulf . The secret was revealed to me by a friend. She told me the story , and gave me directions to find the place. I finished my morning coffee and went down to the seashore. The sun was shining brightly . There, where the olive grove meets the sea , in an unknown quiet north corner of the beach , a small cemetery lies in serenity, hidden among the ancient olive trees and the gigantic, covered with ivy, cypresses . 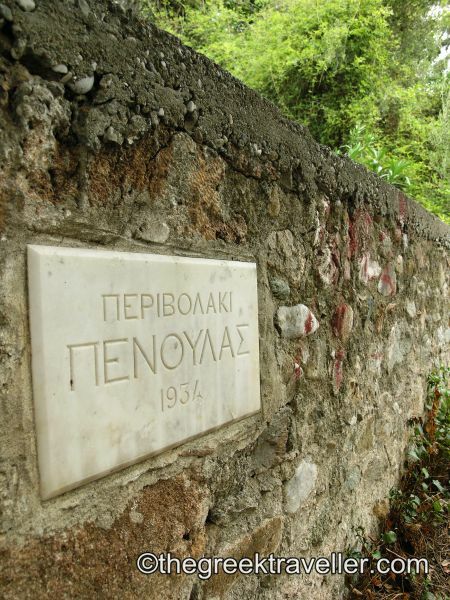 ” Perivolaki of Penoulas , 1934 ,” is written on a marble plaque at the entrance . This is the place I was looking for . The cemetery is private. 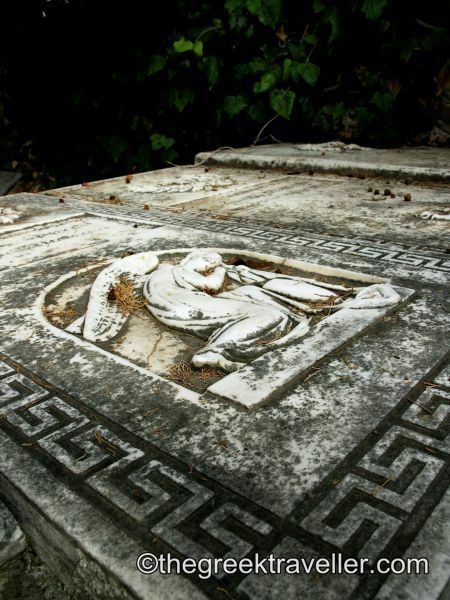 Here the members of the Dumas – Papadopoulos family are buried. Apostlolos Dumas is buried here. He was a rich expat from Odessa (with origins from Tsepélovon, in Epirus) who bought the manor of Orovies since 1831 and after the end of the Turkish occupation of Evia. Interesting information. But the most important secret of the cemetery is other. 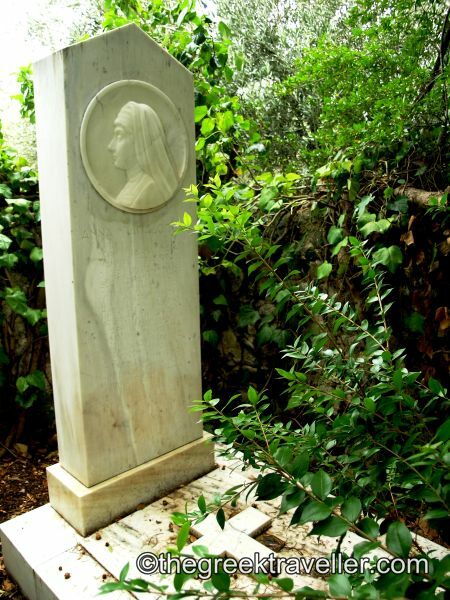 On the northeast corner of the cemetery Anna Papadopoulou Mela , sister of the legendary officer and Greek hero Pavlos Melas is buried. She was named Papadopoulou, taking her husband’s name, whose family owned the manor later (as the last Duma married Papadopoulos). Anna, (1871-1938) is known as ” Mother of the soldier ” as she dedicated all her life to follow the Greek army as a volunteer nurse in the First World War, the Balkan wars and the Asia Minor campaign. After the Asia Minor Catastrophe she lived here in Rovies, helping people until her death. She was a very important figure and prominent personality in the microcosm of the Rovies village. Her humanitarian work is a source of inspiration for several books to date . The ” Mother of the soldier” also created the famous sanatorium near Vitina village, on the central Peloponnesus mountains. “Here a great Greek heart is sleeping… she loved everything beautiful, gentle and polite … “, this is written at the headstone. I loved that I came in Rovies and got as far as here . You too can get in the small cemetery as a tribute to a great woman and to see a monument of the unknown history of Rovies village. Rovies is located in northwestern Evia on the main road connecting Limni village and Edipsos town. 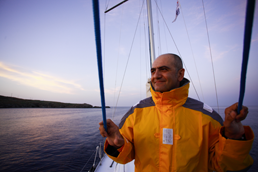 The quickest and easiest way to get here is by car via Arkitsa port, taking the ferry to Edipsos. Rovies is located to the south of Edipsos . The most beautiful way is following the route via Halkida – St. John Rossos – Limni, crossing the famous pine forests and the mountain villages of northern Evia.